Can you believe that it’s February already? Warmer weather seems to be right around the corner but don’t forget to keep sending in coats, hats and gloves for those chilly days. We will go outside if temps are above freezing and the weather permits. It does not always warm up much by the time that we go outside for the morning. I know many of you are beginning to think about summer camps and some of you just read that and had a panic attack because it hasn’t even crossed your mind… Either way, we have you covered… for a couple of weeks at least. Our camp weeks will be May 31-June 3 (Outer Space theme) and June 6-9 (Robots & Engineering Theme). Registration will begin March 7 – look for the link to register via email on March 7. You will receive a discounted rate if you register by Friday, May 1 at 12 p.m.
We had a great time at our Winter Dance Party last month. Thanks to everyone that came to party with us! We are looking forward to Sweetheart’s Day next week as well as Dr. Seuss’ Birthday party in March. The Story Lady (who was at our Fall Carnival) will be here to help us celebrate Dr. Seuss. Both events should be a great time! Parent/Teacher conferences start next week and go through the following week. If you did not receive an email from sign up genius for your class’s conference date, please let me know as soon as possible. There is an article near the end of the newsletter about progress reports, please make sure you read through that. The month of December has been filled with lots of great learning and fun! We are excited to recognize Mason for being our first letter expert! He presented the class with the letter Bb. Way to go Mason. Literacy- This month we enjoyed working on the following concepts: rhyming, making predictions, asking questions and connecting text to life experiences. Math- In math this month, we created a winter bar graph and learned to count to 100. We used Jack Hartmann’s “Count to 100” song that not only helps us with number recognition but also gets us fit at the same time. Social Studies- In social studies this month, we learned about Dr. King. We found out that Dr. King wanted everyone to be treated fairly. To honor his legacy we talked about what “our dream” would be. We also created a unity board located in the upstairs hallway. Art- In art this month, we made snowman in the wind, “Snowy Day Art” inspired by the beloved Ezra Jack Keats book and we made an interactive snow scene that can be viewed from our upstairs window. The month of February will be equally as exciting. We will explore Valentine’s Day, Black History Month, and President’s Day. We will also have another wonderful cooking demo by Mrs. Perryman. We also look forward to Sweetheart Day! The Blue Class kicked off 2016 with lots of fun in January. We learned about the changing seasons, different types of weather and SNOW! 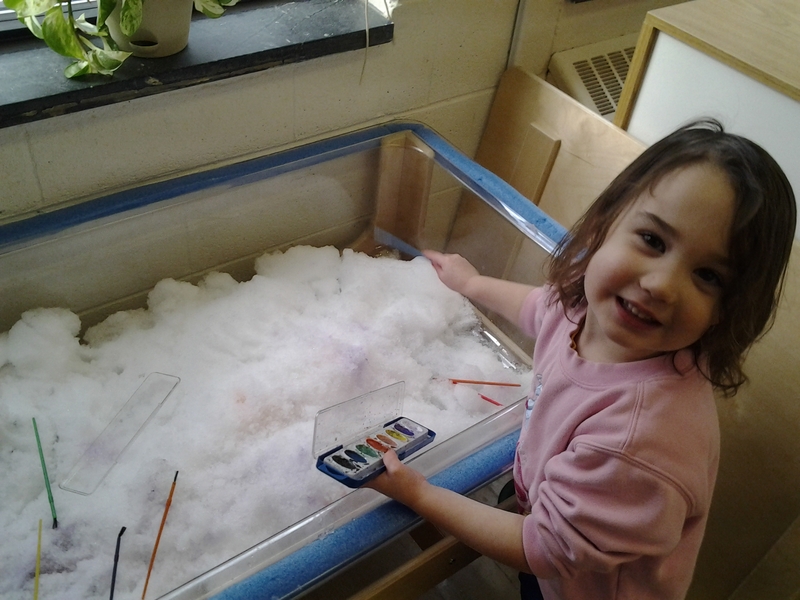 We made pretend snow for the arctic animals living in our sensory table. Thanks to Mother Nature, we were also able to experience lots of real snow both in & out of the classroom. We spelled our names with marshmallows and practiced lacing on paper plate snowmen. We expanded our Spanish sight words to include winter clothing items. One of the highlights in January was participating in our school’s 2nd annual Winter Dance Party – The Blue Class had a blast dancing, climbing, crawling & jumping with their friends. February’s units include Valentine’s Day, Friendship and Family. We will talk about what it means to be a good friend. We will discuss family and how each is different and unique. In math, we will graph the members of our family. In science, we will learn about color mixing. Other activities include making love bugs, number matching with hearts and handprint painting. We will continue to write in our journals and practice our Spanish. The Blue Class loves to sing, play, learn and grow with each other. Happy February everyone! This month, the Purple class will start off talking about Valentine’s Day. The kids will get to make/decorate their own boxes for a Valentine exchange! We will be making some yummy Valentine treats, and even creating our own Valentines for Mom and Dad!! 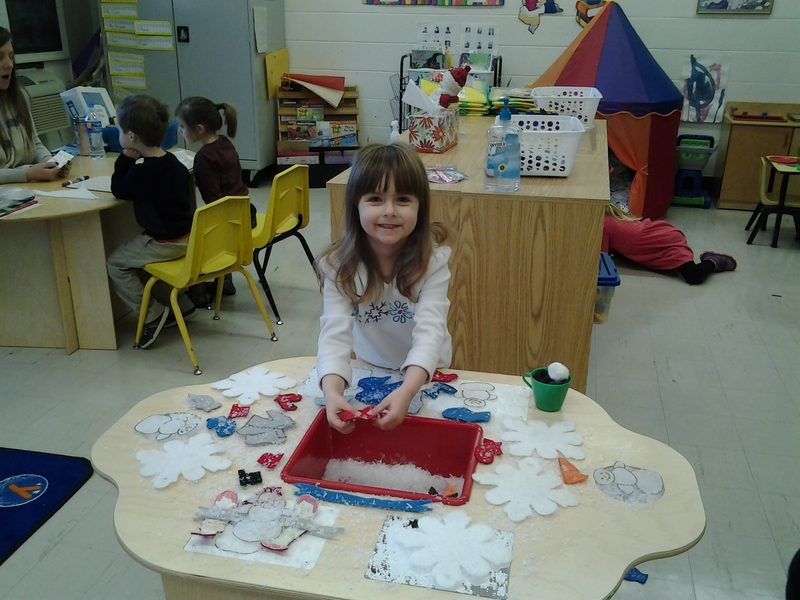 Last month we were talking about snow and what causes snow to fall! As we approach Spring, we will begin to talk about the seasons and what changes will come in March! I am so excited for the coming month and I can’t wait to see what it has to hold for us! It feels like we just got back to school from the Holidays and here we are in February already. During January, we were happy to welcome several new students to our class. In addition to our normal activities, we took some time to get to know our new friends and to share all the exciting things we have been working on this year. In January, we focused on winter. I think reading all those books about snow, may have helped get our current snow fall! We talked about the changes we see in the weather during winter and what animals do when it’s cold outside. Several of our stories this month and songs taught in music, introduced us to animas that hibernate and we enjoyed pretending to hibernate ourselves! Lots of animals like the cold and live where it’s cold all the time and we enjoyed learning about a few of them as well. Many of us brought in pictures of cold weather activities and winter scenes so we spent time sharing what we like to do outside during the winter and what kind of clothes we have to wear when it’s cold. We were hoping for lots of snow so we could build snowmen and make snow angels. I think they got their wish! In February, we will talk a lot about feelings. We will talk about what makes us feel happy, sad, angry, etc. and acceptable ways for us to show those feelings. Save the date- we will celebrate Valentine’s Day on February 9th with our Sweetheart’s Day. On this day, we encourage each child to bring one special person to share this time. You will do a craft with them and then share a snack before heading home. The activities will start at 11:15. If your child doesn’t normally attend that day, feel free to bring them and stay with them for the duration of the party. We will round out the month with some focus on our hand-eye coordination as we practice playing catch. All in all, February will be a month packed with fun activities and hopefully the weather will permit us more playground time than January allowed. February, as we all know, is a month that celebrates love and friendship. We will encourage these concepts through play that requires caring for others and working together. Playing pretend with baby dolls (feeding, rocking, hugging), and working on craft projects in pairs are examples of ways that might emphasize this theme. I must say, the kids have done such a great job welcoming our newest members and they are all getting along wonderfully. This month, in honor of Valentine’s Day, we will also focus on becoming familiar with the color Red. Just as we did with the color Blue in January, many of our games, crafts, and sensory activities will relate to our “Red” theme. January was a short month, frequently interrupted with holidays and snow closures. Unfortunately, we were unable to work on letter recognition as much as I would have liked. Therefore, we will continue to practice and increase exposure to letters A, B, and C throughout the month of February. All lessons, as usual, will be incorporated into play exercises (sensory bins, magnet letters, puzzles, etc. 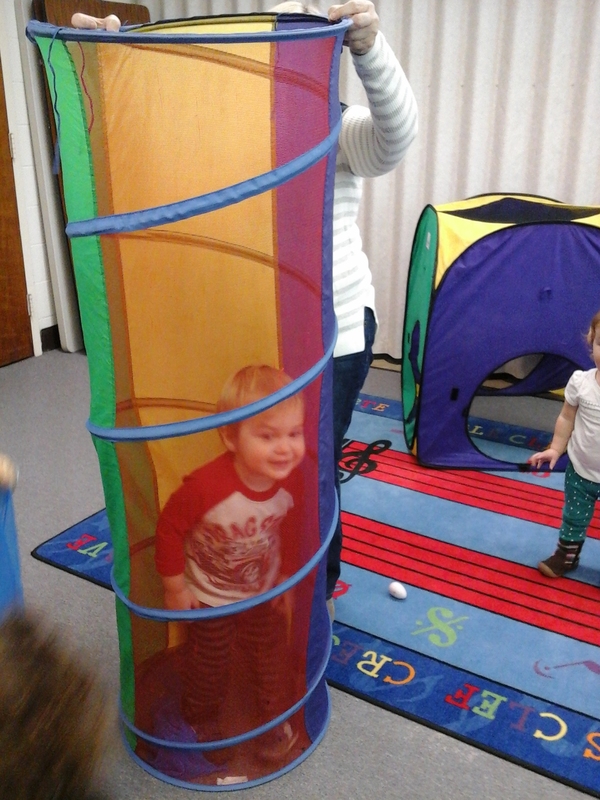 ), circle time activities (songs, rhymes, games, etc. ), and story time (letter books). Please, continue to send your children with coats and warm clothing as we may take them out on the playground. Please, remember to label all outerwear, diaper and wipe bags, and snack items. This reduces the chance of any items being misplaced and simplifies the daily routines for myself and other staff. Continue to check the Shutterfly site for updates, information, and pictures. May you all continue to stay safe and warm through the winter season! Most of you should have received your child’s progress report or will be receiving it in the next few days. We wanted to take a minute and explain why we do progress reports for children in our age groups and what they mean. behaviors and skills that are commonly observed in children with similar ages of your children. Each class has a progress report that is tailored for their age group. The purpose is to give you an idea of what we are observing in our classroom. These observations along with parent/teacher conferences offer us the opportunity to compare what we have observed with what you are seeing at home, as it is not necessarily the same! The reports also provide us with the opportunity to plan lessons for areas that still need work for the class as a whole as well as to individualize instruction for each child. We also hope to see lots of progress over the course of the year and these observations help us remember what the children were doing at different times of the year. If you receive your child’s progress report and have questions, please feel free to talk to their teacher or to contact Jessica in the office.